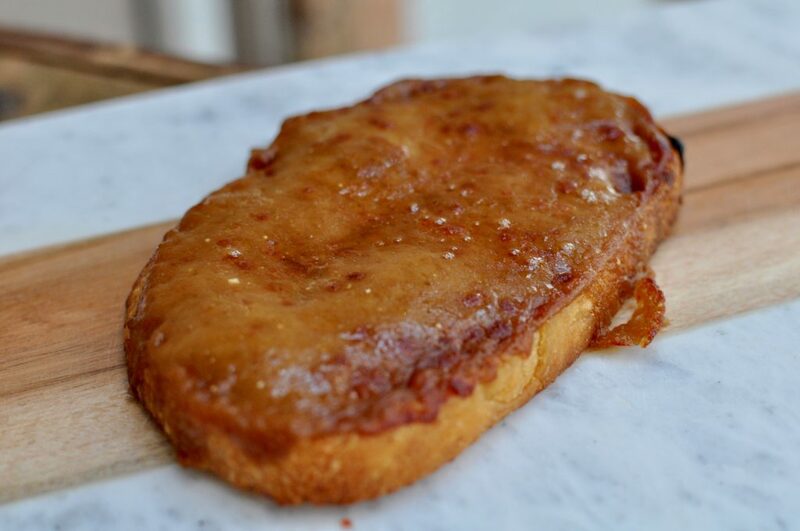 Welsh rarebit… there is nothing quite like it. My introduction to this decadent dish was years ago at a pub just over the Oklahoma border in Kansas. Fast forward 14 years and chef Fergus Henderson, of the infamous St John Bar & Restaurant in London, is on my ever-growing list of must haves. Initially, I was only after one thing…. roasted bone marrow. But then I hear…. “Welsh rarebit to start?”… from the angel in white standing next to my table. You can’t pass on the opportunity to devour, what has to be, the best thing on sliced bread: beer and cheese. I walked in and out with the same thoughts… this place is perfection: the ambience, the food, the wine, the patrons. Fergus, I’ll be back for more. Until then, I’m surviving winter with my best rendition and a nice glass of red wine. Melt the butter in a pan, stir in the flour, and let this cook together until it smells biscuity but is not browning. Add the mustard powder and cayenne pepper, stir in the beer and Worcestershire sauce, then gently melt in the cheese. When it’s all of one consistency, remove from the heat, pour out into a shallow container and allow to set. You can keep in the fridge for a few days at this point. In a cast iron skillet, butter one side of bread and cook util toasted on one side – 2-3 minutes. Spread cheese mixture generously on un-toasted side of bread. Place bread slices on a baking sheet lined with parchment paper and broil for for 2-3 minutes on the middle oven rack. Eat when bubbling golden brown.